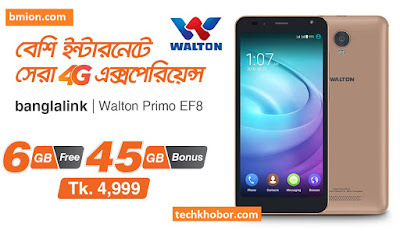 Banglalink Walton PRIMO EF8 4G handset bundle offer 4999Tk - 6GB Free - on pack purchase get up to 45GB bonus for 3 months. One handset to meet all your essential needs! Now, Experience Banglalink 4G network with the new budget friendly Walton Primo EF8 (4G) handset. Get the attractive new Walton Primo EF8 (4G) smartphone only at BDT 4,999 and enjoy 6GB free internet and on pack purchase get up to 45GB bonus for 3 months. Total 6GB Data free for Walton Primo EF8 (4G) handsets. 2GB per month (for 3 months) with 7 days’ validity. Customer can also get 100% bonus if he /she purchases 1.5GB data at BDT 209 (30 Days validity) and 1.5GB data at BDT 99 (7 Days validity). To get 100% bonus on pack purchase for Walton Primo EF8 (4G) handset, customers need to dial *5000*581# (for 30 Days validity) & *5000*799# (for 7 Days validity). Upon completion of bonus volume or validity, data usage will be charged from other active data packs or in PAYG up to 5.6 TK.